Fun? Underwater scooters (DPVs) are great! It’s all fun. 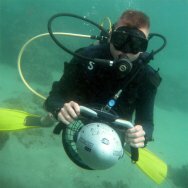 You use all the basic scuba gear and a DPV (underwater scooter). 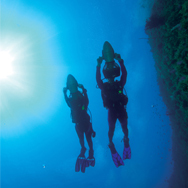 Whether you’re interested in purchasing a DPV or you’re the proud owner of a new underwater jetpack, PADI’s DPV Diver materials provide a comprehensive overview of this exciting area of diving. 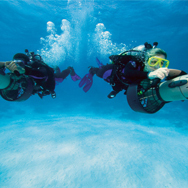 The Diver Propulsion Vehicle Manual and video on DVD cover DPV maintenance, battery care, proper transportation, dive planning considerations and troubleshooting. DPVs can come in handy when wreck diving because they let you tour more of the wreck, plus reduce your air consumption. You may want to consider the Wreck Diver course while working your way to Master Scuba Diver.